Toronto is the largest city in Canada and the fifth largest metropolitian area in North America. Located on the northwestern shore of Lake Ontario, Toronto is the economic center of the Canadian Province of Ontario and the seat of its provincial government. As Canada's economic capital, Toronto's leading economic sectors include finance, business services, telecommunications, aerospace, transportation, media, arts, film, television production, publishing, software production, medical research, education, tourism and sports industries. The Toronto Stock Exchange is headquartered in the city, along with a majority of Canada's corporations. Toronto is heralded as one of the most multicultural cities in the world and is ranked as the safest large urban area in North America by Places Rated Almanac. Over 100 languages and dialects are spoken here, and over one third of Toronto residents speak a language other than English at home. Toronto's population is cosmopolitan and international, which reflects its role as an important destination for immigrants to Canada. As a result of its low crime rates, clean environment and generally high standard of living, Toronto is consistently rated one of the world's most livable cities by the Economist Intelligence Unit and the Mercer Quality of Living Survey. Residents of Toronto are called Torontonians. When Europeans first arrived at the site of present-day Toronto, the vicinity was inhabited by the Huron tribes, who by then had displaced the Iroquois tribes that occupied the region for centuries before c. 1500. The name Toronto is likely derived from the Iroquois word tkaronto, meaning "place where trees stand in the water". It refers to the northern end of what is now Lake Simcoe, where the Huron had planted tree saplings to corral fish. A portage route from Lake Ontario to Lake Huron running through this point led to widespread use of the name. French traders founded Fort Rouillé on the current Exhibition grounds in 1750, but abandoned it in 1759. During the American Revolutionary War, the region saw an influx of British settlers as United Empire Loyalists fled for the unsettled lands north of Lake Ontario. In 1787, the British negotiated the Toronto Purchase with the Mississaugas of New Credit, thereby securing more than a quarter million acres (1000 km²) of land in the Toronto area. In 1793, Governor John Graves Simcoe established the town of York on the existing settlement, naming it after Prince Frederick, Duke of York and Albany. Simcoe chose the town to replace Newark as the capital of Upper Canada, believing the new site would be less vulnerable to attack by the Americans Fort York was constructed at the entrance of the town's natural harbour, sheltered by a long sand-bar peninsula. The town's settlement formed at the eastern end of the harbor behind the peninsula, near the present-day Parliament Street and Front Street. In 1813, as part of the War of 1812, the Battle of York ended in the town's capture and plunder by American forces. The surrender of the town was negotiated by John Strachan. American soldiers destroyed much of Fort York and set fire on the parliament buildings during their five-day occupation. With a population of only 9,000 inhabitants, York was incorporated as the City of Toronto on March 6, 1834, reverting to its original native name. These included escaped African-American slaves fleeing Black Codes in some states, as slavery had been banned outright in Upper Canada by 1806. Reformist politician William Lyon Mackenzie became the first Mayor of Toronto, and led the unsuccessful Upper Canada Rebellion of 1837 against the British colonial government. The city grew rapidly through the remainder of the nineteenth century, as a major destination for immigrants to Canada. The first significant population influx occurred with the Irish potato famine between 1846 and 1849 that brought a large number of Irish diaspora into the city, some of them transient and most of them Catholic. By 1851, the Irish-born population had become the largest single ethnic group in the city. Smaller numbers of Protestant Irish immigrants were welcomed by the existing Scottish and English population, giving the Orange Order significant influence over Toronto society. Toronto was for brief periods twice the capital of the united Province of Canada, first from 1849-1852, following unrest in Montreal and later 1856-1858 after which Quebec became capital until just a year prior to Confederation. Since Confederation, the capital of Canada has been Ottawa. Toronto remained the capital of the province of Ontario after the province's official creation in 1867. Because of its capital status, the city has also always been the location of Government House, the residence of the vice-regal representative of the Crown. The city began to rapidly industrialize in the middle of the nineteenth century. An extensive sewage system was built, and streets became illuminated with gas lighting as a regular service. Long-distance railway lines were constructed, including a route completed in 1854 linking Toronto with the Upper Great Lakes. The Grand Trunk Railway and the Great Northern Railway joined in the building of the first Union Station in downtown. The advent of the railway dramatically increased the numbers of immigrants arriving and commerce, as had the Lake Ontario steamers and schooners entering the port and enabled Toronto to become a major gateway linking the world to the interior of the North American continent. Horse-drawn streetcars gave way to electric streetcars in 1891, when the city granted the operation of the transit franchise to the Toronto Railway Company later re-named the current Toronto Transit Commission, now with the third highest ridership of any city public transportation system in North America. The Great Toronto Fire of 1904 destroyed a large section of downtown Toronto, but the city was quickly rebuilt. The fire had cost more than $10 million in damage, and led to more stringent fire safety laws and the expansion of the city's fire department. The city received new immigrant groups beginning in the late 19th century into early 20th century, particularly Germans, Italians, and Jews from various parts of Eastern Europe. They were soon followed by Chinese, Russians, Poles and immigrants from other Eastern European nations, as the Irish before them, many of these new migrants lived in overcrowded shanty type slums, such as the "the Ward" which was between Bay Street, now the heart of the country finances and the Discovery District, considered one of the world's most advanced medical research zones. Despite its fast paced growth, by the 1920s, Toronto's population and economic importance in Canada remained second to the much longer established Montreal. However, by 1934 the Toronto Stock Exchange had become the largest in the country. Following the Second World War, refugees from war-torn Europe arrived as did construction labourers particularly from Italy and Portugal. Following elimination of racially based immigration policies by the late 1960s, immigration began from all parts of the world. Toronto's population grew to more than one million in 1951 when large-scale suburbanization began, and doubled to two million by 1971. By the 1980s, Toronto had surpassed Montreal as Canada's most populous city and the chief economic hub. During this time, in part due to the political uncertainty raised by the resurgence of the Quebec sovereignty movement, many national and multinational corporations moved their head offices from Montreal to Toronto. 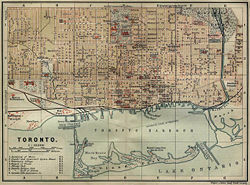 In 1954, the City of Toronto was federated into a regional government known as Metropolitan Toronto. The postwar boom had resulted in rapid suburban development, and it was believed that a coordinated land use strategy and shared services would provide greater efficiency for the region. The metropolitan government began to manage services that crossed municipal boundaries, including highways, water and public transit. 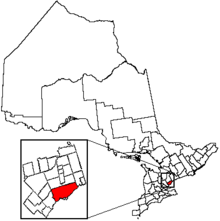 In 1967, the seven smallest municipalities of the region were merged into their larger neighbours, resulting in a six-city configuration that included the old City of Toronto and the surrounding municipalities of East York, Etobicoke, North York, Scarborough and York. In 1998, the metropolitan government was dissolved and the six municipalities were amalgamated into a single municipality, creating the current City of Toronto. 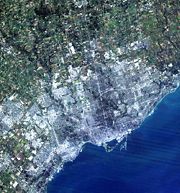 A simulated-color image of Toronto taken by NASA's Landsat 7 satellite. Toronto covers an area of 629.91 square kilometres (243.21 sq mi), with a maximum north-south distance of 21 kilometres (13 mi) and a maximum east-west distance of 43 kilometres (27 mi). It has a 46 kilometre (29 mi) long waterfront shoreline. Its borders are bounded by Lake Ontario to the south, Etobicoke Creek and Highway 427 to the west, Steeles Avenue to the north and the Rouge River to the east. The city is intersected by two rivers and numerous tributaries: the Humber River in the west end and the Don River east of downtown at opposite ends of the Toronto Harbour. The harbour was naturally created by sediment build-up from lake currents that created the Toronto Islands and the Leslie Street Spit. The many creeks and rivers cutting from north toward the lake create large tracts of densely-forested ravines, and provide ideal sites for parks and recreational trails. However, the ravines also interfere with the city's grid plan, and this results in major thoroughfares terminating on one side of ravines and continuing on the other side. Other thoroughfares are required to span above the ravines. These deep ravines prove useful for draining the city's vast storm sewer system during heavy rains but some sections, particularly near the Don River are prone to sudden, heavy floods. Storage tanks at waste treatment facilities will often receive too much river discharge causing them to overflow, allowing untreated sewage to escape into Lake Ontario closing local beaches for swimming. During the last ice age, the lower part of Toronto was beneath Glacial Lake Iroquois. Today, a series of escarpments mark the lake's former boundary, known as the Iroquois Shoreline. The escarpments are most prominent from Victoria Park Avenue to the mouth of Highland Creek, where they form the Scarborough Bluffs. Other noticeable sections include the area near St. Clair Avenue West between Bathurst Street and the Don River, and north of Davenport Road from Caledonia to Spadina Avenue, the Casa Loma grounds sit above this escarpment. Although not remarkably hilly, Toronto does have elevation differences ranging from 75 metres (246 ft) above-sea-level at the Lake Ontario shore to 270 metres (886 ft) ASL near the York University grounds in the city's north end. Much of the current lakeshore land area fronting the Toronto Harbour is actually artificial landfill. In the mid-nineteenth century the lakefront was set back up to a kilometre (0.6 mi) further inland than it is today. Much of the Toronto harbor (the quays, formerly known as wharves) and adjacent Portlands are also fill. The Toronto Islands were actually a landspit until a storm in 1858 severed its connection to the mainland, creating a channel later used by shipping interests to access the docks. Late spring scene in High Park, in Toronto's west end. Toronto's climate is moderate for Canada due to its southerly location within the country and its proximity to Lake Ontario. It has a humid continental climate (Koppen climate classification Dfa), with warm, humid summers and generally cold winters, although fairly mild by Canadian and many northern continental U.S. standards. The city experiences four distinct seasons with considerable variance in day to day temperature, particularly during the colder weather season. Due to urbanization and other factors Toronto has a fairly low diurnal temperature range, at least in built-up city and lakeshore areas. At different times of the year, the proximity to Lake Ontario and the other Great Lakes has various localized and regional impacts on the climate, including lake effect snow. Toronto winters sometimes feature short cold snaps where maximum temperatures remain below -10 °C (14 °F), often made to feel colder by windchill. Snowstorms, sometimes mixed with ice and rain can disrupt work and travel schedules, accumulating snow can fall anytime from November until mid-April. However, mild stretches also occur throughout winter melting accumulated snow, with temperatures reaching into the 5 to 14 °C (40 to 57 °F) range and infrequently higher. Summer in Toronto is characterized by long stretches of humid weather. Daytime temperatures occasionally surpass 35 °C (95 °F), with high humidity making it feel oppressive during usually brief periods of hot weather. Spring and Autumn are transitional seasons with generally mild or cool temperatures with alternating dry and wet periods, typical conditions of both seasons usually arrive later than in other continental climates at similar latitudes owing to the presence of Lake Ontario and to a lesser degree, the other Great Lakes. Precipitation is fairly evenly distributed throughout the year, but summer is usually the wettest season, the bulk falling during thunderstorms. The average yearly precipitation is 834 mm(32.83 in), with an average annual snowfall of about 133 centimetres (52 in). Toronto experiences an average of 2,038 sunshine hours or 44 percent of possible, most of it during the warmer weather season. Toronto has become an architectural hotspot featuring uniquely designed buildings from many of the most celebrated architects in the world. The list includes such names as Frank Gehry, Daniel Libeskind, Norman Foster, Will Alsop, I. M. Pei, Santiago Calatrava, and Mies van der Rohe as well as award-winning local firms, such as Shore Tilbe Irwin & Partners, Kuwabara Payne McKenna Blumberg (KPMB) and Diamond Schmitt Architects. 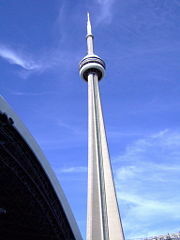 A close-up view of the CN Tower from Rogers Centre. Defining the Toronto skyline, the CN Tower is Canada's most recognizable and celebrated icon. At a height of 553.33 m (1,815 ft., 5 inches) it is the world's tallest freestanding structure, an important telecommunications hub, and a centre of tourism in Toronto. Toronto's most prominent landmark is the CN Tower, which currently stands as the tallest free-standing land structure in the world at 553 metres (1,815 ft). BCE Place is an office complex in downtown Toronto, which consists of two towers, the Bay Wellington Tower and the TD Canada Trust Tower, linked by the six-storey Allen Lambert Galleria. BCE Place is also the home of the Hockey Hall of Fame. The Allen Lambert Galleria, sometimes described as the "crystal cathedral of commerce," was designed by Spanish architect Santiago Calatrava. It is one of the most photographed spaces in Toronto's financial district, and is heavily featured as a backdrop for TV and film productions. View of skyscrapers in the Financial District from the CN Tower. Toronto is a city of high-rises, having 1,892 buildings over 90m (300') in height, second only to New York City (which has over 5,000 such buildings) in North America. Most of these buildings are residential (either rental or condominium). There has been recent media attention given for the need to retrofit many of these buildings, which were constructed beginning in the 1950s as residential apartment blocks to accommodate a quickly growing population. Many of the older buildings are shown to give off high concentrations of carbon dioxide (CO2) and are thought to be a significant contributor to the urban heat island effect, in addition to the aesthetic concerns as many of the buildings are viewed by many as urban blights often surrounded by limited landscaping and concrete parking lots without integration with the surrounding neighborhoods. The various residential communities of Toronto express a character distinct from that of the skyscrapers in the commercial core. Victorian and Edwardian-era residential buildings can be found in enclaves such as Rosedale, Forest Hill, Cabbagetown, the Annex, the Bridle Path and Moore Park. Wychwood Park is historically significant for the architecture of its homes, and for being one of Toronto's earliest planned communities. The Wychwood Park neighborhood was designated as an Ontario Heritage Conservation district in 1985. The Casa Loma neighbourhood is named after Casa Loma, a medieval castle built in 1911 that had an elevator, secret passages, and bowling alleys. Spadina House is a nineteenth century manor that is now a museum. The Old City of Toronto covers the area generally known as Downtown. It is the historical core of Toronto and remains the msot densely-populated part of the city. 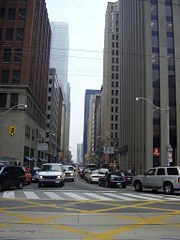 The Financial District of Bay Street contains the largest cluster of skyscrapers in Canada. Other neighborhoods in the central city retain an ethnic identity, including two Chinatowns, the popular Greektown area, the very trendy Little Italy, Portugal Village, Little Jamaica, Little Mogadishu and Little India along with others. One of Toronto's most unique neighborhoods, the Distillery District contains the largest and best-preserved collection of Victorian industrial architecture in North America. A national heritage site, it was listed by National Geographic magazine as a "top pick" in Canada for travellers. Large tracts of industrial land still exist particularly with Scarborough and Etobicoke, although not to the extent that they once did. Roy Thomson Hall, home of the Toronto Symphony Orchestra. Toronto is a major scene for theatre and other performing arts, with more than 50 ballet and dance companies, six opera companies, and two symphony orchestras. The city is home to the National Ballet of Canada, the Canadian Opera Company, and the Toronto Symphony Orchestra. Notable performance venues include the Four Seasons Centre for the Performing Arts, Roy Thomson Hall, the Princess of Wales Theatre, the Royal Alexandra Theatre, Massey Hall, the Toronto Centre for the Arts, the Elgin and Winter Garden Theatres and the Hummingbird Centre (formerly the "O'Keefe Centre"). Ontario Place features the world's first permanent IMAX] movie theatre, the Cinesphere, as well as the Molson Amphitheatre, an open-air venue for large-scale music concerts. Each summer, the Canadian Stage Company presents an outdoor Shakespeare production in Toronto’s High Park called "Dream in High Park." Canada's Walk of Fame acknowledges the achievements of successful Canadians, with of a series of stars on designated blocks of sidewalks along King Street and Simcoe Street. The Hockey Hall of Fame, housed in a former bank erected in 1885, is located at the intersection of Front Street and Yonge Street in Downtown Toronto. Toronto's Caribana festival takes place from mid-July to early August of every summer, and is one of North America's largest street festivals. For the most part, Caribana is based on the Trinidad and Tobago Carnival, and the first Caribana took place in 1967 when the city's Caribbean community celebrated Canada's Centennial year. Forty years later, it has grown to attract one million people to Toronto's Lake Shore Boulevard annually. Tourism for the festival is in the hundred thousands, and each year, the event brings in about $300 million. Dundas Square and the Eaton Centre at night. The Royal Ontario Museum (ROM) is a major museum for world culture and natural history. The Toronto Zoo. The Art Gallery of Ontario contains a large collection of Canadian, European, African and contemporary artwork. Gardiner Museum of Ceramic Art which is the only museum in Canada entirely devoted to ceramics and the Museum's collection contains more than 2,900 ceramic works from Asia, the Americas, and Europe. The Ontario Science Centre always has new hands-on activities and science displays particularly appealing to children, and the Bata Shoe Museum also features many unique exhibitions. The Don Valley Brick Works is a former industrial site, which opened in 1889, and has recently been restored as a park and heritage site. The Canadian National Exhibition is held annually at Exhibition Place. It is Canada's largest annual fair and the fifth largest in the world, with an average attendance of 1.3 million. The Yorkville neighborhood is one of Toronto's most elegant shopping and dining areas. On many occasions, celebrities from all over North America can be spotted in the area, especially during the Toronto International Film Festival. The Toronto Eaton Centre is one of North America's top shopping destinations, and Toronto's most popular tourist attraction with over one million visitors per week. Greektown brightens Christmas and winter at Alexander the Great park. Aromas from around the world tempt crowds at Taste of the Danforth in Greektown. Greektown on the Danforth, is another one of the major attractions of Toronto which boasts one of the highest concentrations of restaurants per kilometre in the world. It is also home to the annual "Taste of the Danforth" festival which attracts over one million people in two and a half days. Toronto is also home to Canada's most famous castle - Casa Loma, the former estate of Sir Henry Pellatt, a prominent Toronto financier, industrialist and military man. Other notable neighborhoods and attractions include The Beaches, the Toronto Islands, Kensington Market, Fort York, and the Hockey Hall of Fame. Bay Street, looking south from its intersection with Queen Street West. Toronto is a major international centre for business and finance. Generally considered the financial capital of Canada, Toronto has a high concentration of banks and brokerage firms on Bay Street, the city's main financial street. The Toronto Stock Exchange is the world's sixth-largest stock exchange by market capitalization. All of the Big Five banks of Canada are headquartered in Toronto. The city is an important centre for the media, publishing, telecommunications, information technology and film production industries. Although much of the region's manufacturing activities take place outside the city limits, Toronto continues to be an important wholesale and distribution point for the industrial sector. The city's strategic position along the Quebec City-Windsor Corridor and its extensive road and rail connections help support the nearby production of motor vehicles, iron, steel, food, machinery, chemicals and paper. The completion of the St. Lawrence Seaway in 1959 gave ships access to the Great Lakes from the Atlantic Ocean. Atrium of the Hospital for Sick Children. Designed by Eberhard Zeidler. 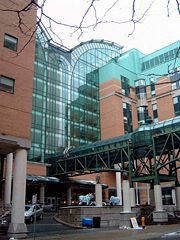 Toronto is home to at least 20 hospitals, and is a center of research in biomedicine. Toronto is also home to the Medical and Related Sciences Centre (MaRS), which was created in 2000 to capitalize on the research and innovation strength of the Province of Ontario. Another institute is the McLaughlin Centre for Molecular Medicine (MCMM). The main entrance of the Beaux-Arts style Union Station built in 1927. The Toronto Transit Commission (TTC) is the third largest public transit system in North America after the New York City Transit Authority, and Mexico City Metro. The Government of Ontario operates an extensive rail and bus transit system called GO Transit that links the neighboring cities and suburbs with the City of Toronto. Thirty-eight trains on seven train lines run 179 trips, and carry over 160,000 passengers a day. An additional 288 buses feed the main rail lines. The TTC provides public transit within the City of Toronto. Its backbone is the city's subway system, which includes the "U"-shaped north-south Yonge-University-Spadina line, the east-west Bloor-Danforth line, the east-west Sheppard line through the northern part of the city, and the Scarborough RT line running through the eastern part of the city (Scarborough). The TTC also operates an extensive network of buses and streetcars. Canada's busiest airport, Toronto Pearson International Airport (IATA: YYZ), straddles the city's western boundary with the suburban city of Mississauga. Limited commercial and passenger service is also offered from the Toronto City Centre Airport (usually called the "Island Airport"), located on the Toronto Islands. Toronto/Buttonville Municipal Airport in Markham provides general aviation facilities. Downsview Airport, near the city's north end, is owned by de Havilland Canada and serves the Bombardier Aerospace aircraft factory. 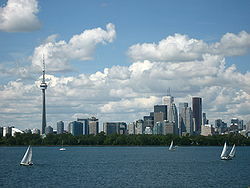 Statistics Canada reported 2,615,060 people residing in Toronto in 2011. The city's population grew by 4 percent (96,073 residents) between 1996 and 2001, at an annualized rate of 0.8 percent. Persons aged 14 years and under made up 17.5 percent of the population, and those aged 65 years and over made up 13.6 percent. The median age was 36.9 years. As of 2001, 42.8 percent of the residents of the city proper belong to a visible minority group, and visible minorities are projected to comprise a majority in Toronto by 2017. According to the United Nations Development Programme, Toronto has the second-highest percentage of foreign-born population among world cities, after Miami, Florida. While Miami's foreign-born population consists mostly of Cubans and other Latin Americans, no single nationality or culture dominates Toronto's immigrant population. In 2001, people of European ethnicities formed the largest cluster of ethnic groups in Toronto, 62.23 percent, mostly of English, Scottish, Irish, Italian, and French origins, while the five largest visible minority groups in Toronto are Chinese (10.6 percent), South Asian/Indo-Caribbean (10.3 percent), Black/Afro-Caribbean (8.3 percent), Filipino (3.5 percent) and Latin American (2.2 percent). This diversity is reflected in Toronto's ethnic neighbourhoods which include Little Italy, The Junction, Little Jamaica, Little India, Chinatown, Koreatown, Greektown, Greektown, Portugal Village, Portugal Village, Corso Italia, Kensington Market, and The Westway. Christianity is the largest religious group in Toronto. The 2001 Census reports that 31.1 percent of the city's population is Catholic, followed by Protestant at 21.1 percent, Christian Orthodox at 4.8 percent, and other Christians at 3.9 percent. Other religions in the city are Islam (6.7 percent), Hinduism (4.8 percent), Judaism (4.2 percent), Buddhism (2.7 percent), Sikhism (0.9 percent), and other Eastern Religions (0.2 percent). 18.7 percent of the population professes no faith. Toronto City Hall viewed from Nathan Phillips Square. At the start of the 2007 term, the city council had seven standing committees, each consisting of a chair, a vice-chair and four other councillors. The Mayor named the committee chairs and the remaining membership of the committees is appointed by City Council. Toronto had an operating budget of C$7.6 billion in 2006. 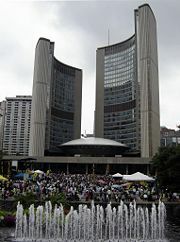 The city receives funding from the Government of Ontario in addition to tax revenues and user fees, spending 36 percent on provincially-mandated programs, 53 percent on major municipal purposes such as the Toronto Public Library and the Toronto Zoo, and 11 percent on capital financing and non-program expenditures. The main building of Victoria College in the University of Toronto. Toronto is home to a diverse range of public and private educational institutions. The Toronto District School Board operates 451 public schools and 102 Secondary or high schools. This makes the TDSB the largest school board in Canada. Additionally, the Toronto Catholic District School Board manages the city's publicly-funded Roman Catholic schools, while the Conseil scolaire de district du Centre-Sud-Ouest and the Conseil scolaire de district catholique Centre-Sud manages public and Roman Catholic French-language schools. There are also numerous private university-preparatory schools. The University of Toronto, established in 1827, is the oldest university in the province of Ontario and a leading public research institution. It is a worldwide leader in biomedical research and houses North America's third largest library system, notably after Harvard University and Yale University. The city is also home to Ryerson University, York University and the Ontario College of Art & Design. There are five diploma-granting community colleges in Toronto. The Royal Conservatory of Music, which includes The Glenn Gould School, is a major music school located in downtown. The Canadian Film Centre is a film, television and new media training institute founded by filmmaker Norman Jewison. ↑ 1.0 1.1 1.2 1.3 1.4 1.5 1.6 Statistics Canada, Census Profile. Retrieved June 15, 2012. ↑ The real story of how Toronto got its name Natural Resources Canada (2005) accessdate 2006-12-08 from Alan Rayburn, Canadian Geographic (September/October 1994). (Ottawa): 68-70. ↑ Fort Rouillé, Jarvis Collegiate Institute (2006). Retrieved on 2006-12-08. ↑ Carl Benn, The History of Toronto, an 11,000 Year Journey. Natives and newcomers, 1600-1793, City of Toronto (2006). Retrieved on 2006-12-08. ↑ Westward ho? The shifting geography of corporate power in Canada, Journal of Canadian Studies (2002). Retrieved on 2007-01-14. ↑ Municipality of Metropolitan Toronto Act, Government of Ontario (2000). Retrieved on 2006-12-29. ↑ Population statistics and land area, Statistics Canada (2001). Retrieved on 2006-12-05. ↑ 11.0 11.1 Canadian climate normals for 1971 to 2000, Environment Canada (2004). Retrieved on 2006-12-05. ↑ The World's First Permanent IMAX Theatre Retrieved on 2007-05-02. ↑ Toronto Caribbean Carnival (Caribana) Festival 2006, WORD Magazine (2006). Retrieved on 2006-12-11. ↑ CNE - About Us, Canadian National Exhibition (2006). Retrieved on 2006-12-29. ↑ Market Statistics Toronto Stock Exchange (2006). Retrieved on 2007-05-11. ↑ Medical and Related Sciences Centre, Medical and Related Sciences Centre (2006). Retrieved on 2006-12-05. ↑ McLaughlin Centre for Molecular Medicine (MCMM), McLaughlin Centre for Molecular Medicine (2006). Retrieved on 2006-12-05. ↑ Toronto transit chief says searches unlikely (2005). Retrieved on 2007-02-03. ↑  City of Toronto (1997). Retrieved on 2007-05-08. ↑  City of Toronto (2003). Retrieved on 2007-05-08. ↑  Statistics Canada (2006). Retrieved on 2007-05-08. ↑ 32.0 32.1 Community Highlights for Toronto, Statistics Canada (2001). Retrieved on 2006-12-05. ↑ Canada's visible minority population in 2017,  Statistics Canada (2005). Retrieved on 2006-12-05. ↑  Statistics Canada (2001). Retrieved on 2007-05-08. ↑ Population by selected ethnic origins for Toronto, Statistics Canada (2001). Retrieved on 2006-12-05. ↑ Various Languages Spoken - Toronto CMA, Statistics Canada (2001). Retrieved on 2007-01-02. ↑ Language used at work by mother tongue in Toronto CMA, Statistics Canada (2001). Retrieved on 2006-12-05. ↑ Language used at work by mother tongue (City of Toronto), Statistics Canada (2001). Retrieved on 2006-12-05. Benn, Carl. The History of Toronto, an 11,000 Year Journey. Fulford. Robert. 1995. Accidental city: the transformation of Toronto. Toronto: Macfarlane, Walter & Ross. ISBN 0921912919. Rayburn, Alan. 2001. Naming Canada: stories about Canadian place names, 2nd ed. Toronto: University of Toronto Press. ISBN 0802082939. The official City of Toronto Web site. Tourism Toronto, by the Toronto Convention & Visitors Association.